The word planet comes from the Greek word planets, which means 'wanderer.' This is because the planets appear to wander amongst the fixed stars in the night sky as they orbit the sun. As of June 2013, approximately 900 planets have been identified in the universe. However, it's estimated that there are trillions of them out there. Scientists believe it's very likely that one of these trillions of planets is capable of supporting life. In our solar system, there are eight official planets. Listed in order of proximity to the sun, they are: Mercury, Venus, Earth, Mars, Jupiter, Saturn, Uranus & Neptune. A great way to remember the order is to use the acronym: My Very Eager Mother Just Served Us Nachos. Planets are large natural objects that orbit, or travel around, stars. Eight planets orbit the star called the Sun. In order from the closest to the Sun, these planets are Mercury, Venus, Earth, Mars, Jupiter, Saturn, Uranus, and Neptune. ... Planets differ from other objects such as comets, asteroids, and meteors. Mercury is a small planet which orbits closer to the sun than any other planet in our solar system. ... The surface of Mercury is very similar to our moon. It has a very barren, rocky surface covered with many craters. Mercury is made out of a large percentage of heavier elements, mainly iron. It is essentially a large metal ball of iron with a very thin silicate crust. Mercury's core makes up about 75% of the planet. Its thin mantle, or crust, is only about 300 to 400 miles thick (500 to 600 km). Mercury has no moon most likely because they are too close to the Sun. Since Mercury has hardly any atmosphere, it does not have weather like storms, clouds, winds or rain. Its surface temperature can reach 801 Fahrenheit during the day (because it is so close to the Sun) and can drop to -137C degrees Celsius at night (because there is no atmosphere to trap the daytime heat). The entire surface of Venus is constantly covered by clouds. These clouds are made up mostly of carbon dioxide which has a greenhouse affect keeping in the Sun's heat like a giant blanket. As a result Venus is the hottest planet in our solar system. It is even hotter than Mercury, which is much closer to the Sun. Mercury has no moon most likely because they are too close to the Sun. Venus is made up of a central iron core and a rocky mantle, similar to the composition of Earth. Its atmosphere is mainly made up of carbon dioxide (96%) and nitrogen (3%), with small amounts of other gases. Venus would not be a pleasant place for people to live in the solar system. The planet's active volcanoes and runaway greenhouse effect would make it a difficult place to survive. Between its desiccated, red-orange landscape and surface temperatures hot enough to melt lead, Venus is our solar system's analog to hell. The climate on Venus is widely known to be unpleasant -- at the surface, the planet roasts at more than +426C degrees Celsius under a suffocating blanket of sulfuric acid clouds and a crushing atmosphere more than 90 times the pressure of Earth's. Earth is the third planet from the Sun and the only object in the Universe known to harbor life. According to radiometric dating and other sources of evidence, Earth formed over 4.5 billion years ago. Earth's gravity interacts with other objects in space, especially the Sun and the Moon, Earth's only natural satellite. Earth revolves around the Sun in 365.26 days, a period known as an Earth year. During this time, Earth rotates about its axis about 366.26 times. The Earth is 93 million miles, or 150 million kilometres from the Sun. The Earth is unlike every other planet in the Solar System in a number of different ways. It is the only planet that has an atmosphere containing 21 percent oxygen. The Earth is the only inner planet (Mercury, Venus, Earth and Mars) to have one large satellite, the Moon. Mars has two very tiny moons. Mercury and Venus have none. The Earth is fragile. Its surface is split into plates (tectonic plates) which float on a rocky mantle – the layer between the surface of the earth, its crust, and its hot liquid core. The inside of the Earth is active and earthquakes, volcanoes and mountain building takes place along the boundaries of the tectonic plates. As a result of the Earth’s geological activity (the volcanoes and earthquakes) the surface of the Earth has far fewer craters than the surface of planets such as Mars, Venus and Mercury or the surface of the Moon. The craters have sunk down or been worn away by wind and rain over millions of years. As the Earth orbits round the Sun it tilts very slightly and so gives us the seasons. When the Earth has tilted so that the northern half of the Earth is a little away from the Sun, the northern hemisphere (meaning half of the Earth’s sphere) has winter. At this time the southern hemisphere is tilted very slightly towards the Sun and the southern hemisphere has summer. Winter in Ireland means summer in New Zealand. Closer to the Equator there is much less difference between summer and winter. Mars is the fourth planet from the Sun and is the second smallest planet in the solar system. Named after the Roman god of war, Mars is also often described as the “Red Planet” due to its reddish appearance. Mars is a terrestrial planet with a thin atmosphere composed primarily of carbon dioxide. Mars is more than 142 million miles from the sun. The planet is about one-sixth the size of Earth. Mars is known as the Red Planet. It gets its red colour from the iron in its soil. In January 2006, the probe left Earth at 36,000 mph (58,000 kph). If such a probe traveled in a straight line to Mars, the time it would take to get to Mars would be: Closest possible approach: 942 hours (39 days). By definition, a sidereal day on Mars is the length of time that it takes the planet to rotate once on its axis so that stars appear in the same place in the night sky. On Earth, this takes exactly 23 hours, 56 minutes and 4.1 seconds. In comparison, on Mars, a sidereal day lasts 24 hours, 37 minutes, and 22 seconds. Time on Mars is easily divided into days based on its rotation rate and years based on its orbit. Sols, or Martian solar days, are only 39 minutes and 35 seconds longer than Earth days, and there are 668 sols (684 Earth days) in a Martian year. Although Mars is smaller than the Earth, at 11% of Earth's mass, and 50% farther from the Sun than the Earth, its climate has important similarities, such as the polar ice caps, seasonal changes and the observable presence of weather patterns. Mars has two relatively small (compared to Earth's) natural moons, Phobos (about 22 km (14 mi) in diameter) and Deimos (about 12 km (7.5 mi) in diameter), which orbit close to the planet. Jupiter is the fifth planet from the Sun and the largest in the Solar System. It is a giant planet with a mass one-thousandth that of the Sun, but two-and-a-half times that of all the other planets in the Solar System combined. Jupiter and Saturn are gas giants; the other two giant planets, Uranus and Neptune are ice giants. Its atmosphere is made up of mostly hydrogen gas and helium gas, like the sun. The planet is covered in thick red, brown, yellow and white clouds. One of Jupiter's most famous features is the Great Red Spot. The temperature in the clouds of Jupiter is about minus 145 degrees Celsius. The temperature near the planet's center is much, much hotter. The core temperature may be about 24,000 degrees Celsius. That's hotter than the surface of the sun! The Great Red Spot is a giant, spinning storm in Jupiter's atmosphere. It is like a hurricane on Earth, but it is much larger. Jupiter's Great Red Spot is more than twice the size of Earth! Winds inside this storm reach speeds of about 434km/hr. The Great Red Spot is an anti-cyclonic (high- pressure) storm on Jupiter that can be likened to the worst hurricanes on Earth. An ancient storm, it is so large that three Earths could fit inside it. There are 69 known moons of Jupiter. This gives Jupiter the largest number of moons with reasonably stable orbits of any planet in the Solar System. The most massive of the moons are the four Galilean moons, which were independently discovered in 1610 by Galileo Galilei and Simon Marius and were the first objects found to orbit a body that was neither Earth nor the Sun. From the end of the 19th century, dozens of much smaller Jovian moons have been discovered and have received the names of lovers or daughters of the Roman god Jupiter or his Greek equivalent Zeus. The Galilean moons are by far the largest and most massive objects to orbit Jupiter, with the remaining 65 known moons and the rings together comprising just 0.003% of the total orbiting mass. Saturn is the sixth planet from the Sun and the second-largest in the Solar System, after Jupiter. It is a gas giant with an average radius about nine times that of Earth. It has only one-eighth the average density of Earth, but with its larger volume Saturn is over 95 times more massive. Saturn is named after the Roman god of agriculture; its astronomical symbol (♄) represents the god's sickle. Saturn's interior is probably composed of a core of iron–nickel and rock (silicon and oxygen compounds). This core is surrounded by a deep layer of metallic hydrogen, an intermediate layer of liquid hydrogen and liquid helium, and finally a gaseous outer layer. Saturn has a pale yellow hue due to ammonia crystals in its upper atmosphere. Electrical current within the metallic hydrogen layer is thought to give rise to Saturn's planetary magnetic field, which is weaker than Earth's, but has a magnetic moment 580 times that of Earth due to Saturn's larger size. Saturn's magnetic field strength is around one-twentieth of Jupiter's. The planet's most famous feature is its prominent ring system that is composed mostly of ice particles, with a smaller amount of rocky debris and dust. At least 62 moons. are known to orbit Saturn, of which 53 are officially named. This does not include the hundreds of moon lets in the rings. Titan, Saturn's largest moon, and the second-largest in the Solar System, is larger than the planet Mercury, although less massive, and is the only moon in the Solar System to have a substantial atmosphere. Uranus is the seventh planet from the Sun. It has the third-largest planetary radius and fourth-largest planetary mass in the Solar System. Uranus is similar in composition to Neptune, and both have different bulk chemical composition from that of the larger gas giants Jupiter and Saturn. For this reason, scientists often classify Uranus and Neptune as "ice giants" to distinguish them from the gas giants. Uranus's atmosphere is similar to Jupiter's and Saturn's in its primary composition of hydrogen and helium, but it contains more "ices" such as water, ammonia, and methane, along with traces of other hydrocarbons. It is the coldest planetary atmosphere in the Solar System, with a minimum temperature of 49 K (-224C degrees Celsius) and has a complex, layered cloud structure with water thought to make up the lowest clouds and methane the uppermost layer of clouds. Like the other giant planets, Uranus has a ring system, a magnetosphere, and numerous moons. The Uranian system has a unique configuration among those of the planets because its axis of rotation is tilted sideways, nearly into the plane of its solar orbit. Its north and south poles, therefore, lie where most other planets have their equators. Uranus has 27 known natural satellites (Moons). The five main Moons are Miranda, Ariel, Umbriel, Titania, and Oberon. Thirteen distinct rings are presently known, the brightest being the ε ring. All except two rings of Uranus are extremely narrow – they are usually a few kilometres wide. The rings are probably quite young; the dynamics considerations indicate that they did not form with Uranus. The matter in the rings may once have been part of a moon (or moons) that was shattered by high-speed impacts. From numerous pieces of debris that formed as a result of those impacts, only a few particles survived, in stable zones corresponding to the locations of the present rings. Neptune is the eighth and farthest known planet from the Sun in the Solar System. 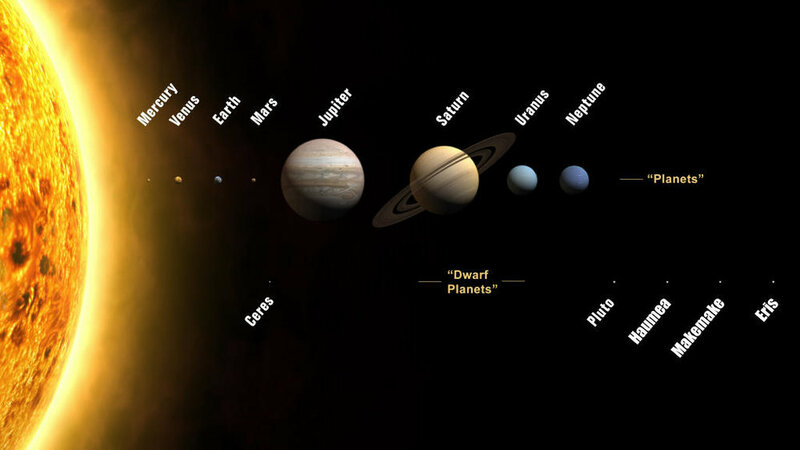 In the Solar System, it is the fourth-largest planet by diameter, the third-most-massive planet, and the densest giant planet. Neptune is 17 times the mass of Earth and is slightly more massive than its near-twin Uranus, which is 15 times the mass of Earth and slightly larger than Neptune. Neptune orbits the Sun once every 164.8 years at an average distance of 30.1 AU (4.5 billion km). Its largest moon, Triton, was discovered shortly thereafter, though none of the planet's remaining known 13 moons were located telescopically until the 20th century. The planet's distance from Earth gives it a very small apparent size, making it challenging to study with Earth-based telescopes. Neptune was visited by Voyager 2, when it flew by the planet on 25 August 1989. In contrast to the hazy, relatively featureless atmosphere of Uranus, Neptune's atmosphere has active and visible weather patterns. For example, at the time of the Voyager 2 flyby in 1989, the planet's southern hemisphere had a Great Dark Spot comparable to the Great Red Spot on Jupiter. These weather patterns are driven by the strongest sustained winds of any planet in the Solar System, with recorded wind speeds as high as 2,100km/hr. Neptune has several faint rings around it. There are three main rings which are very thin and dark. The rings are made up of small rocks and dust. Neptune's rings are not the same thickness all around. Neptune five rings names: Galle, Le Verrier, Lassell, Arago, and Adams. Its rings were named after the astronomers who made an important discovery regarding the planet. This definition, which applies only to the Solar System, states that a planet is a body that orbits the Sun, is massive enough for its own gravity to make it round, and has "cleared its neighbourhood" of smaller objects around its orbit. Earth and the other three inner planets of our solar system (Mercury, Venus and Mars) are made of rock, containing common minerals like feldspars and metals like magnesium and aluminium. So is Pluto. The other planets are not solid. Jupiter, for instance, is made up mostly of trapped helium, hydrogen, and water. A "planet" is a celestial body that is in orbit around the Sun, has sufficient mass for its self-gravity to overcome rigid body forces so that it assumes a hydrostatic equilibrium (nearly round) shape, and has cleared the neighbourhood around its orbit. As the planets in our Solar System get further away from the Sun, they generally get colder. So what is the coldest planet of our Solar System. That would be Neptune, the 8th and final planet in the Solar System. If Pluto was still a planet, it would be colder, but now it's Neptune. Although Neptune, the farthest planet from the sun, is pretty damn cold (-182C degrees celsius), Uranus takes the prize for being our solar system's coldest planet. The lowest temperature ever recorded on Uranus was -188C degrees Celsius. Largest Planet: Jupiter. The largest planet in our solar system by far is Jupiter, which beats out all the other planets in both mass and volume. Jupiter's mass is more than 300 times that of Earth, and its diameter, at 140,000 km, is about 11 times Earth's diameter. + IS THE MOON A PLANET? It's not a star. Is the Moon a planet? Well, not really, as a planet is an object that orbits a star, and the Moon orbits the Earth (and yes, wannabe pedants, it really does orbit the Earth and not the Sun). A satellite is a generic term for an object that orbits another object. The planet Jupiter has the shortest day of all the eight major planets in the Solar System. It spins around on its axis once every 9 hr 55 min 29.69 sec. Jupiter has a small axial tilt of only 3.13 degrees, meaning it has little seasonal variation during its 11.86-year-long orbit of the Sun. Venus is the slowest - it rotates once every 243 days —- by far the slowest rotation period of any of the major planets. A Venusian sidereal day thus lasts more than a Venusian year (243 versus 224.7 Earth days). Venus has an extremely slow rotation rate, to the point that it actually rotates slower than it revolves around the sun. In other words, its day is longer than its year. Time taken by a planet to revolve around the sun is directly proportional to its distance from it. Since the status of Pluto is now only a dwarf planet, Neptune is the slowest. The fastest rotating planet around axis is Jupiter which takes approximately 9 hrs to spin once. It only takes 88 days for Mercury to orbit around the sun. No other planet travels around the sun faster. The planet Venus is so bright in the night sky that you may think it is a star. PLUTO Pluto hit the headlines in 2006 when it was demoted from a planet to a dwarf planet by the International Astronomical Union. While most astronomers agreed with the new classifications, some disagreed and still refer to Pluto as the ninth planet. CERES Ceres is located in the asteroid belt between the orbits of Mars and Jupiter. It was discovered in 1801, well before Pluto and 45 years before Neptune. Ceres was considered a planet for around 50 years before being reclassified as an asteroid and once again in 2006 as a dwarf planet. ERIS Eris was discovered in 2005 and was referred to as the tenth planet until it was reclassified in 2006. It is the largest of the dwarf planets. Makemake Makemake was discovered in 2005 and the third largest dwarf planet behind Eris and Pluto. Haumea Haumea was discovered in 2004 and named a dwarf planet in 2008.